The S.C. Department of Natural Resources will assist in hosting the 2016 World National Archery in the Schools Tournament June 24-26 at the Myrtle Beach Sports Center in Myrtle Beach. The tournament will consist of teams from across North American and Asia. A total of 4,378 youth archers registered to participate in the National Archery in the Schools (NASP) World Bullseye Tournament, and 1,120 are registered for the NASP World 3D Tournament being held at the same time. South Carolina is well represented with 35 school teams sending archers to compete in this World Tournament. South Carolina has two archers who will be competing that recently took high honors at the NASP National Tournament where nearly 13,000 archers competed. Riverlee Weaver of Socastee, a member of the St. James High School team of Murrells Inlet, placed third in the nation in the Bullseye Tournament and earned a spot on the NASP All-Star team that will be traveling to South Africa in July. Tabitha Way of Duncan, shooting for the Carolina Warriors Homeschool Team, placed second in the ladies division in the IBO 3-D Challenge. The S.C. Department of Natural Resources wishes good luck to all youth archers from the Palmetto State. 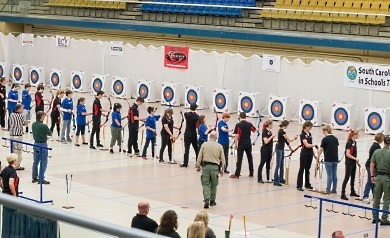 For more information on the NASP World Tournament in Myrtle Beach, visit http://naspschools.org/events/?t=4. For more information about starting the National Archery in the Schools Program in your school, contact Staff Sgt. Scott Stephens at StephensM@dnr.sc.gov or call (843) 616-2151.